The upcoming release of Dharma production’s baby, ‘Kalnak’ has set promotional activities in full swing. The audiences were finally able to catch the film’s much-awaited trailer, and boy was it worth the wait! Complex characters, intriguing setting and the pre-independence communal tensions along, the film seems to have the all the makings of a blockbuster. Just like the film’s teaser, the filmmakers hosted an event that unveiled the film’s trailer. Naturally, the film’s cast were VIPs at the event. The entire cast walked in elaborate, ethnic ensembles, a nod to their characters’ aesthetics from the film, and were dressed to the nines. But our eyes were glued to Alia Bhatt and Sonakshi Sinha. Both actresses chose embellished, floor-length Anarkali suits. The full-sleeved Anarkali suits had sombre necklines, mimicking the modest aesthetics of desi royal princesses. With an embroidered Anamika Khanna Anarkali, Ali’s look could easily be mistaken for a look that required minimal styling. But a deeper look proved that Alia’s look was carefully orchestrated to perfection. With oxidized pearl earring from Nora Jewelry and bouncy waves tied away from the face, Alia looked ethereal. The appliqué dupatta was a gorgeous accessory, which Alia carried with grace. 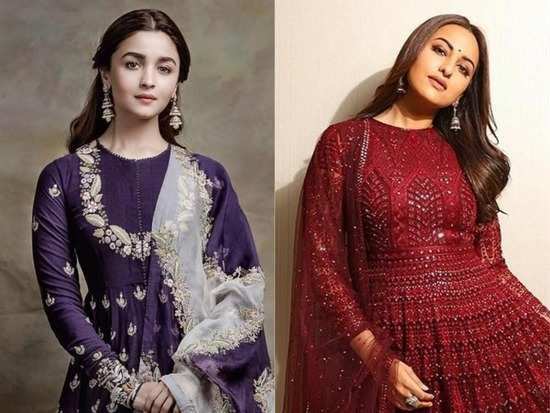 Sonakshi’s oxblood Anarkali by Falguni Shane Peacock looked gorgeous on her olive toned skin. The Anarkali featured tone-tone embellishments head to toe, making it pretty appropriate for the day time event. We were totally living for perfectly blown out hair and subtle brown smokey eye makeup look that made her big brown eyes stand out! Both the looks so were so brilliantly styled, that it would be a crime to ask us to pick a favourite. At the risk of sounding orthodox, we loved that both the actresses managed to look drop dead gorgeous without even a peak of skin show – and that is worth making a note for. Their looks go to on to prove that modest looks are NOT boring! What do you think? 2Sonam Kapoor slayed in white, *again*! 3Shilpa Shetty’s latest look is proof that Orange is *definitely* the new black! 4Sonam Kapoor’s opulent white ensemble has a personal detail you may have missed! 6Day 3 of Bombay Times Fashion Week was a glamorous one! 9Bollywood inspired ways to wear white to your Holi party this year! 10Priyanka Chopra Jonas’s sheer polka dot number and top-knot has the potential to be your uniform for summers!